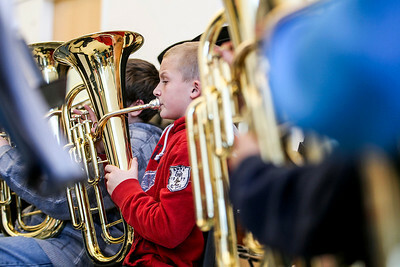 Sarah Nader- snader@shawmedia.com Seventh-grader Cooper Schmidt, 12, plays the tuba during band practice at Cary Junior High School Monday, February 3, 2014. Even though this school year District 26 brought back art and music to daily instruction, it did not bring back the Cary Junior High Band. The void had been filled by the Cary Band Association, which provides lessons for students at a cost. 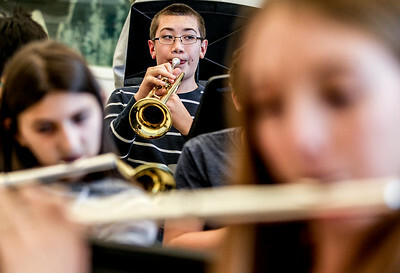 Sarah Nader- snader@shawmedia.com Seventh-grader Henry Kmiec, 12, plays the trumpet during band practice at Cary Junior High School Monday, February 3, 2014. Even though this school year District 26 brought back art and music to daily instruction, it did not bring back the Cary Junior High Band. The void had been filled by the Cary Band Association, which provides lessons for students at a cost. Sarah Nader- snader@shawmedia.com Band Director Alex Carlson (right) conducts his students during band practice at Cary Junior High School Monday, February 3, 2014. Even though this school year District 26 brought back art and music to daily instruction, it did not bring back the Cary Junior High Band. The void had been filled by the Cary Band Association, which provides lessons for students at a cost. 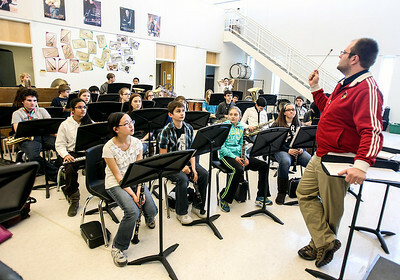 Band Director Alex Carlson (right) conducts his students during band practice at Cary Junior High School Monday, February 3, 2014. Even though this school year District 26 brought back art and music to daily instruction, it did not bring back the Cary Junior High Band. The void had been filled by the Cary Band Association, which provides lessons for students at a cost.